My undergraduate studies took me through a wide range of the social sciences and liberal arts. I was an English major with a concentration in Secondary Ed, but I took sociology classes every chance I got and I even took five semesters of German (guten Tag!). Anyway, in one of my sociology classes I learned about the broken windows theory of criminology. It’s controversial and I’m not sure I agree with its implications, but the gist of it is that petty crime and disorder create an atmosphere conducive to more serious crime. One broken window that doesn’t get fixed leads to more broken windows, which leads to a sense that nobody really cares and that it’s okay to treat the neighborhood and the people who live in it with disrespect. This theory is great when it motivates people to clean up blighted neighborhoods, not so great when cops start cracking down on petty crime in the hopes that it’ll scare away the big fish (but that’s just my opinion). Anyway, I broke this pane of glass on our front door on Christmas Eve as we were rushing out of the house. We taped some cardboard up over it and figured we’d deal with it after the holidays. The good news is that this is a part of the house that nobody ever sees. I actually had to walk around to the alley and between two fences to get here. Literally nobody can see this unless they are in this difficult-to-access spot on purpose. The bad news is that the plumber just temporarily put everything back in place and it’s up to us to actually repair the siding. Two different types of siding meet just a few feet away from here. Note additional chaos: weeds and filth (algae? mildew?). And I see another spot of messed up siding over there in the corner. Old houses are so charming and full of character, but you’ve got to stay on top of them. One neglected problem can quickly snowball, just like disorder in a troubled neighborhood. Things seem to have been getting away from us lately and to distract ourselves from the expensive new roof that’s looming in our future we decided to finally tackle the front door. It was actually so much cheaper and easier than we’d anticipated! The glass was only about $4 and cut to size for free at Lowe’s. Not pictured: a hammer to help us use the flathead screwdriver as a chisel and remove old nails. Step one: use a utility knife to score the paint over the moldings. This is about as far as Nick got before I kicked him out and took over. Next, I used a screwdriver and a hammer to gently, carefully chisel the very old wood molding loose. I tried not to let it get too torn up but a certain amount of damage was inevitable. I’m pretty sure these doors are original to the house and thus nearly a century old. The nails holding them in stayed in the frame even after I’d tugged the moldings free. I waited until I had all the moldings and glass out to use the claw of my hammer to pull them. Bam. Moldings gone and we could carefully remove the broken glass. This was surprisingly satisfying. 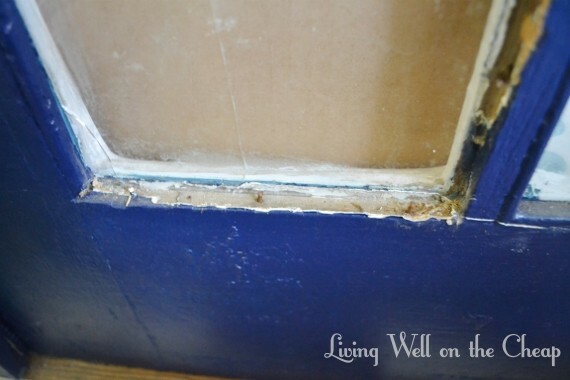 I could lie and say that I popped my new glass in and replaced the moldings and it was so easy! But actually even though I’d told the lady at Lowe’s “Well, I measured the opening to be six and a quarter by twelve and a quarter but it probably needs to be a little bigger to fit properly,” it turns out I should’ve been more specific because she cut it to exactly 6.25″x12.25″ and it was too small. I had to go back to Lowe’s but luckily they let me return it with no problem and I was back home in no time with a new piece. This time I asked them to cut it to 6.75″ by 12.75″ and it fit so perfectly that I had to carefully coax it into the frame, diligently removing any splinters or scraps that stood in its way. 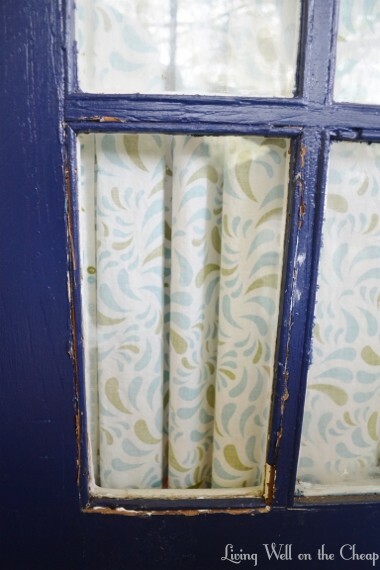 Also, a piece of molding near the bottom right had always been missing (disguised previously with paint on the glass) so Nick cut a tiny piece of scrap beadboard to length and it was just right. I used some caulk and my brad gun to carefully tack all the molding to the frame and then filled all the gaps and cracks with caulk. After the caulk had dried I touched up the paint (luckily I just painted this door last summer) and still had the paint on hand). Now it looks not good as new, but old and charming and not broken. So, now that my front door no longer screams DISREPAIR maybe the rest of the house will get its act together? We’re working on the kitchen currently but next is fixing up the deck, then cleaning and repairing the siding, replacing the roof (gulp), and hopefully if things go well repainting the exterior trim. Home ownership is bittersweet. Yeah once the moldings were out I could measure the actual opening and was surprised that it was actually that big! I figured working in the windows department she would know how much bigger it needed to be but when she spoke not a single word to me it probably should’ve been a red flag. That looks great! It does seem like home maintenance issues tend to come in groups and then you might get a break for awhile. Definitely a labor of love keeping up with an older home!! Oh I so hope there’s a break around the corner! You’re so right that it’s a labor of love. Love what you did there, with the analogy! Yay social work!!! So nice to “meet” you!